Fujian province is a southern coastal province comprised of beautiful landscapes and rich local cultures. Historically, the coastal regions of Fujian had been in connection with the outside world through trade, while the vast mountainous interior had remained secluded and unexplored. Today, Fujian is a prosperous land and many of its cultural treasures are displayed to the outside world. Our expedition will be focused on the areas around Xiamen on the coast, and the Yongding region in the interior, bringing a contrasting perspective of traditional cultures and influences of the western cultures in China. Xiamen is a modern but lay-back city surrounded by beautiful sandy beaches. With a history dating back to the 14th century, this young city was also one of China's first treaty ports after the Opium War. Contact with the west started in the 16th Century, and a stroll through the winding streets of the Gulangyu Island will provide glimpses of its colonial past. 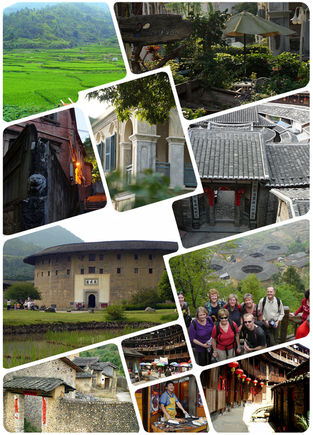 We'll also spend 2 days visiting the Hakka Villages in the Yong Ding area. 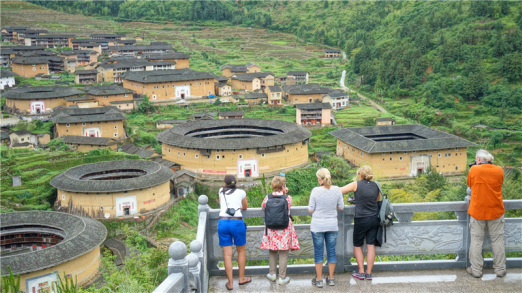 The Hakka Villages featuring the "Tulous" (earth buildings) that are both round and square dates back to 200 to 500 years. These fortress-like giant Tuluos were built as defence against attacks from bandits and wild animals. The houses are made of earth, wood, and stone using glutinous rice as the main adhesive agent. These houses take from 2 to 15 years to construct. The largest of these houses can house up to a thousand people, and store enough food to last for months. Today, more and more of these houses had been left vacant, as the locals embrace life of the modern world. The Hakka Earth Houses had been enlisted as a cultural heritage of the world by UNESCO in 2008. We’ll spend most of our time in Taxia, a somewhat remote and picturesque village out of the tourist trail where most earth buildings are still occupied by villagers. We will do a nice hike on the surrounding rice terraces on the last day. 10:00 - 11:50 - Take flight to Xiamen via MF8502 from Hongqiao Airport. Transfer to Xiamen city center for 4* hotel check-in. After check in, transfer to the ferry dock, board ferry for the Gulangyu Island (+/- 10 min). Explore Gulangyu with your trip leader on foot. Lunch together as a group, and free exploration on your own in the afternoon or with your trip leader. Dinner on your own. Return to the city by ferry, return to the hotel; Free evening. Morning check out after breakfast; Drive to a quiet Hakka village Fenglin (+/3.5 hrs) and then hike on the tea terraces after lunch there. After walk around the village, drive to the famous Hakka Village of Taxia with a big group of Hakka buildings of both round and square. Stay overnight at a traditional Hakka Tulou house in Taxia village after dinner. After breakfast explore this beautiful village also named longevity village followed by visiting another oldest Tulou cluster in Yongding county and then drive back to Xiamen after lunch. Arrive the airport by 17:00 for check in. 19:00 - 21:00 take flight MF8545 to Shanghai Hongqiao Airport. Please Note: This cost excludes the flight tix, you can book by yourself or we can book for you for free.